Solid stoppage-time defending earned the Stormers a 22-19 away Super Rugby victory over the Lions on Saturday at Ellis Park in Johannesburg. The Cape Town team rose three places to second in the southern hemisphere inter-provincial championship table after repulsing 36 phases before Lions centre Howard Mnisi knocked on. Clinging to a three-point advantage after the hooter sounded, the Stormers had to take a 22-metre line drop-out. Substitute fly-half Kurt Coleman launched a huge kick that landed inside the Lions '22' - and seven minutes of drama began. Phase by phase, a Johannesburg side seeking a first win of the young season patiently edged toward the Stormers try-line. Several times they came within a few metres of the objective, but a Stormers side inspired by skipper and No.8 Duane Vermuelen hung on. The Lions were awarded two easily kickable penalties and each time skipper and No.8 Warren Whiteley opted to run the ball. But the gamble finally backfired when substitute Mnisi - one of eight players axed from the starting line-up after a heavy loss at the Sharks last weekend - lost the ball forward. Defeat kept the Lions bottom of the table and the hollow consolation from the Stormers match was a losing bonus point. Whiteley defended his decision to twice run the ball rather than kick at goal. "It is the nature of the side to go for a win," he explained. "Losing like this is very tough, but I am so proud of the boys. While a lack of discipline let us down at times, no one can fault the effort put in by every Lion. Staying positive is crucial now as we head off on a tour of Australasia," said the Springboks fringe forward. A try from flank Warwick Tecklenburg and a conversion and penalty from fly-half Elton Jantjies gave the Lions a 10-point lead before Stormers fly-half Demetri Catrakilis replied with three penalties. Another Jantjies penalty left the hosts with a 13-9 half-time advantage. 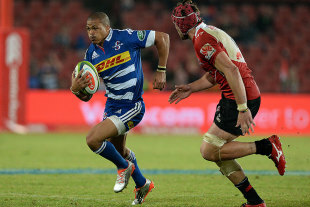 Jantjies and Catrakilis slotted two penalties each before the Stormers snatched the lead for the first time three minutes from time. Coleman kicked a penalty into touch rather than going for the posts, Argentine lock Manuel Carizza won the line-out, and a driving maul culminated in flanker Siya Kolisi dotting down. The gutted Lions then watched Coleman convert from the touchline.